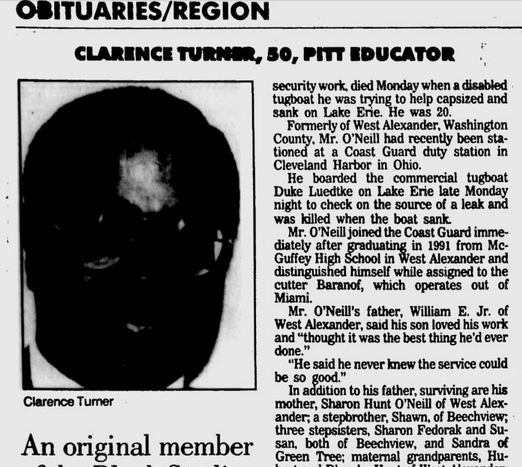 Clarence “Rollo” Turner, in Obituaries section, Pittsburgh Post-Gazette, September 24, 1993. (http://news.google.com). Two months ago, the University of Illinois Urbana-Champaign rescinded a job offer they had made to Steven Salaita (then an associate professor of English at Virginia Tech) for a tenured position in American Indian Studies over a bunch of his allegedly anti-Israel tweets. Between mainstream media and social media, the response against this attack on academic freedom and traditional hiring protocols has been tremendous. Thousands of academicians have signed petitions, penned articles and canceled speeches and events at UIUC over Chancellor Phyllis Wise and the Illinois board of trustees’ decision to take back their offer of employment. While the American Association of University Professors, the American Studies Association, the Foundation for Individual Rights in Education, and so many others have argued that Professor Salaita should be in the classroom teaching his courses this fall, this issue is about more than academic freedom and UIUC following job offer guidelines. The fact is, non-tenure-stream faculty lack the protections and supportive outrage that academia has poured out for those in tenure-track and tenured positions like Professor Salaita. So many contingent faculty lose their jobs over far less than an impolite tweet or an excited utterance. Yet it doesn’t become a story in The New York Times or a petition letter with over 2,000 signatures. No, most contingent faculty, when they lose their jobs, often do so in obscurity, often over doing their jobs with the idea that they were free to teach as they saw fit. The sadder fact, though, is that this isn’t a new phenomenon at all. Take the case of Clarence Rollo Turner, who passed away twenty-one years ago last month at the age of 50. He was once a veteran senior lecturer in the Department of Black Studies at the University of Pittsburgh, as well as my one-time professor for his History of Blacks in Sports course during the spring semester of 1990. I took Turner’s course in my junior year for an easy-A in the midst of taking a bunch of upper-level undergraduate (and one graduate) history courses that semester. Turner’s was a fun course, and he was a knowledgeable professor beyond its contents. Who knew that in three and a half years the politics of academia would cut short the life of a pioneer? It points to the reality that with half of all higher education instructors serving as contingent faculty, academic freedom is an oxymoron and job protections have become secondary to academic politics and fundraising efforts. If you’ve never heard of Rollo Turner, it’s mostly because he didn’t have the opportunity to turn himself into a household name in or out of academia, even in Pittsburgh. And, of course, because most non-tenured and non-tenure-stream faculty are seldom central figures at their universities or in their fields just because they’re very good instructors. Turner, though, was a founding member of the Black Studies Program-turned-department (now of Africana Studies) at the University of Pittsburgh. The university had hired Turner in the wake of a game-changing sit-in of Black undergraduate and graduate students in their takeover of an entire floor of the university’s central computer systems on Martin Luther King, Jr.’s birthday in 1969. It was a protest over the lack of student and faculty diversity at the University of Pittsburgh in general. But it was also a protest to demand a Black Studies program that would represent the research and experiences of Blacks on Blacks on an otherwise lily-White Campus, one engaged exclusively in research that almost always excluded Blacks. In the process of starting this program, the university hired faculty who had yet to earn their doctorates, in some cases with barely a bachelor’s degree. This was 1969, though, when not having a PhD didn’t automatically disqualify candidates from a full-time academic position. Turner was one of several beneficiaries from this change of climate at the University of Pittsburgh, as he was finishing up a master’s degrees in Sociology at Indiana University when the University of Pittsburgh hired him (Turner, incidentally, had helped lead protests for more Black inclusion and a Black Studies program at Indiana in 1968). Turner took on a joint appointment with the Department of Sociology and with the new Black Studies Program, teaching courses like the Sociology of the Black Family, Introduction to Black Studies and his History of Blacks in Sports along the way. Although the standard courseload for a full-time faculty member at the University of Pittsburgh was five over two semesters per year, Turner had been on a 2-2 schedule from September 1969 through December 1991. For more than twenty-two years, Turner had only taught four courses per year. When the then-new department chair Brenda Berrian demanded that Turner take on a third course in January 1992, he refused, citing his twenty-two year history with the Black Studies Department and the last-minute nature of the request as reasons. Berrian then moved to terminate Turner. She and two Pitt police officers arrived in Turner’s classroom on the first Friday of the spring semester and had him removed from his classroom and escorted out of the building. Berrian fired him in the middle of his lecture, in front of a room full of students. This was how The Pitt News first reported the incident, and it was corroborated by everything that Rollo Turner told me a few weeks later. But though it was that heavy-handed, it was hardly that simple. Turner had gotten himself caught up in a battle that involved his contingent employment status, degree completion, departmental reputation and petty ideological politics. More than twenty-two years as a non-tenured senior lecturer with only a master’s degree and a few publications that included two book-length bibliographies had caught up with Turner. As a contingent faculty member, even with over two decades put in, Turner lacked the protections afforded tenure-stream and tenured faculty members. Granted, at $37,000 a year and living in Pittsburgh at the time in 1992, Turner was a very well-paid senior lecturer. At least, that’s what many would argue today. This was also Berrian’s position as Turner’s termination turned into a $60,000 lawsuit. Beyond the issue of compensation, contracts and contingent status was what Berrian and the other tenured faculty of the Department of Black Studies wanted for the department’s future. They wanted to bolster the department’s reputation within and outside the University of Pittsburgh. They wanted to be a full-fledged department in which students could major in Black Studies (students could only earn a minor in the subject until 1993), and perhaps, even offer a master’s degree in the field. Two things stood in the way of this progression. One was the fact that half of the department’s faculty didn’t have doctorates, now a much bigger deal in 1992 than it had ever been in 1969. Two was that not everyone wanted to go in the ideological direction that Berrian had chosen for the Department of Black Studies. She wanted to move toward an Afrocentric approach in teaching and conducting research, something Turner openly rejected as “nonsense.” The idea of a litmus test for what was and wasn’t authentically “Black” or “African” was too extreme for Turner. As a tenured faculty member, Turner’s objections may well have cost him political clout within the department, but it wouldn’t have cost him his job. Turner sued Berrian and the University of Pittsburgh for wrongful termination – stemming in no small part from a hostile work environment – and breach of contract (his was a three-year contract with a year and a half left on it). The suit dragged on in the Civil Court division of Allegheny County Common Pleas Court well into 1993 as Turner – with two daughters in college and a son in the middle of high school – went over a year and a half without a paycheck. As late as August 1993, the month before he died, Turner told me that things on the lawsuit front had taken a turn for the better. Despite the stress of the situation, he hadn’t let Berrian or the University of Pittsburgh “steal his inner peace,” Turner said. Yet even with years of Buddhism and meditation under his belt and a lifestyle that included biking through all parts of Pittsburgh, Turner died in late-September 1993. No doubt that between the stress of his lawsuit, the sense of betrayal, and the financial upheaval, it all caught up with him. Rollo Turner may well have become a mentor of mine because of the stand that he took, minus the strength of a union or support from a substantial number of tenured faculty. None of this was possible in the end. Precisely because contingent faculty seldom have rights that tenured faculty and university administrators are bound to respect. There are so many lessons to be learned here, lessons that resonate with me more now as an adjunct professor than they did when I was a graduate student or when I worked in the nonprofit world. Contingent faculty shouldn’t rock the boat, take a controversial stance, or involve themselves in hot-button issues within their field or department. Or that anyone serving as non-tenured faculty without a doctorate should endeavor to write their dissertation at break-neck speed. Or really, if given the choice, why would anyone who could possibly do anything else with their lives in academia, especially anything that could provide more security and protection, choose a job as a contingent faculty member, whether in 1992 or 2014? Mostly, it points to the reality that university leaders tend to see much of the talent in academia – non-tenured faculty among others – as expendable. That, and the fact that this expendability has grown with the rapid increase in contingent faculty (and graduate students, for that matter) teaching courses once reserved for tenure and tenure-stream instructors. Until contingent faculty, graduate student teaching assistants and tenured/tenure-stream professors unionize and take a collective stand on working conditions and job protections, cases like Turner’s will continue to go cold and remain tragic ones, with no end in sight.